We’ve collected some of our Events and Mini-Events into PDF format, so that you can take the Event with you wherever you game. Three-Act Events published by the bullpen at Plot Points, including Supplements to those in-house original Events. When the Reed Richards of an alternate reality comes home and finds his Earth destroyed and all those he loved dead, he vows to create a new, perfect world where nothing bad will ever happen again. Gathering three other like-minded individuals from other realities, Reed created the Council of Four and enacted his plan to create his perfect reality. Play as your favorite Marvel NOW! heroes as you embark on an adventure unlike any other as you travel across the Multiverse, saving other realities and your own from the diabolical machinations of the Council of Four. Featuring over 80 all-new Watcher and Player datafiles, this 189-page Event boasts a collection of heroes and villains unlike any MHRPG Event before it, complete with non-stop action and high-stakes combat. Will the combined effort of the Multiverse’s mightiest heroes be enough to defeat the Council of Four? Or is the Multiverse doomed for destruction? In this reimagining of the catalyst for House Of M, the heroes must track down an insane Scarlet Witch, discover the source of her madness, and free her from it, all while surviving in the nonsensical world that she has created with her hex power. Superhumans are new to the world and the world does not yet fully trust these self-proclaimed heroes. Governments, militaries, and the common man all fear these beings that can bend a bar of steel with their hands or read the minds of an entire city with just a thought. All the progress that heroes made to bridge this gap of trust was ruined when the Justice Lords arrived – super-powered dictators from another dimension that came and enslaved humanity. The heroes of our world rose up to defeat them, but not before humanity’s trust in superhumans was shattered. Now, a threat even greater than the Justice Lords is rising to power and the heroes have no idea how worse matters are about to become. This three-Act Event will allow players to delve into their favorite superheroes from the DC Comics universe. Players will clash with villains and try to win over a populace that fears them. And when a young boy named Adam literally throws himself into the heroes’ arms, how will they react to him? Who is Adam? And why are these shadow monsters chasing him? As the heroes unravel the mystery of Adam, they will discover a threat greater than they have ever faced. Will they be able to make the hard choice to stop this threat from destroying everything? Featuring 20 all-new, never before seen Hero datafiles of your favorite DC heroes from Aquaman to Zatanna, over 40Watcher datafilesof iconic villains from Atrocitus to Victor Zsasz, and a wealth of side missions, you and your table will be more than equipped to fully experience the full 130+ pages of Suffer the Children Event as well as stage your own Events in the narrow streets of Gotham City or amidst the glistening spires of Metropolis. Cyclops and Jean Grey have been abducted. Professor Xavier struggles against a techno-organic virus. The X-Men, X-Factor, and X-Force must forge an uneasy alliance. And to defeat the mysterious Stryfe, they must join forces with Apocalypse himself. 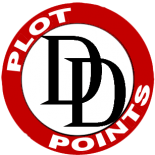 One- or Two-Act Mini-Events published by the bullpen at Plot Points. Forget galaxy-spanning wars and superhumans drawing political and ideological lines in the sand. Sometimes, all you want to do is get the guns off the streets and out of the criminals’ hands. Supplements to official Events like Civil War, which were published by MWP.